When it comes to fire alarm monitoring and fire sprinkler monitoring in Canada, the standard to meet is ULC-S561. This is the standard which is referenced in the Canadian Building Code and Canadian Fire Code when it comes to how to perform fire alarm monitoring. Similarly, when fire alarm monitoring and fire sprinkler monitoring is referenced at the provincial level, ULC-S561 is also the referenced standard. This is certainly true when we talk about fire alarm monitoring in the Ontario Fire Code and Ontario Building Code. If you wish to go more in depth on this subject, you can read a previous blog post on these items here. The only way to prove that the building you are having fire monitoring performed on is being monitored to the ULC-S561 standard is to have a ULC certificate issued on that site. Simply because the company you hired is a “ULC-listed company” does not mean that the system is a ULC-listed system. If any one of the five items above does not meet the ULC specification, then the system you have installed is not a ULC fire monitoring system. It is not fair to expect that building owners, or even Fire Prevention Officers from your local Authority Having Jurisdiction to know exactly what equipment or methods are current with the ULC-S561 standard. The security industry is constantly releasing new equipment and new ways to monitor that meet the ULC standard. This is why the ULC certificate is so important. Having a ULC certificate issued to your site means that the fire monitoring installation is subject to inspection by the ULC during the life of the certificate. The ULC will attend the site and inspect the installation, inspect the monitoring station and all signal records to ensure that the system with the certificate is meeting the ULC standard. This does NOT happen if a ULC certificate is not issued to the site. 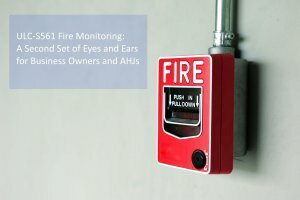 If systems do not comply, monitoring companies and fire monitoring installers can be held accountable by the ULC with repercussions involving their listing. The ULC certificate adds a layer of accountability that does not exist without a certificate being issued. When a certificate issued (and a n3w certificate needs to be issued with each new company you hire to perform monitoring – a certificate does not transfer from one company to the next), you can rest assured that a second set of “eyes and ears” are looking at that system to make sure that it is compliant. Business owners and Fire Prevention officers alike can be sure that a valid certificate means that they can move on to other pressing concerns within the building. If you wish to know what a ULC certificate looks like, and all of the components, you can view that here. The lesson is: for fire alarm monitoring installations, always ask for a ULC certificate stating compliance with ULC-S561. This will get that extra set of eyes and ears on your system and you can rest easy knowing the system is properly installed.